I'm kinda weird when it comes to vinegar on my food. I hate salt and vinegar potato chips. HATE them. The mere idea of them kind of triggers my gag reflex. But strangely, there have been exactly 2 times in my life when I discerned a distinct craving for them deep in my gut. Both times I had been working for a long time and had sweated a lot. No doubt I had lost a lot of salt, but I craved both salt and vinegar. Each time, I found some salt and vinegar chips nearby, devoured the entire single-serving bag in a matter of seconds, and the craving passed. And I mean it was GONE, never to return. The most recent of these cravings occurred about 5 years ago. Haven't had one since. But balsamic vinegar, on the other hand, makes a great salad dressing. If there's a balsamic vinegar option for my salad at a restaurant, that's usually the one I'll pick these days. I often get a raised eyebrow or two when I ask for the balsamic dressing. I think people expect men not to order salads, and in the rare case that they do, they're expected to ask for ranch or some other more masculine dressing. Plus, they usually mix the balsamic with some kind of fruitiness: raspberry, apple cider, pear, or something along those lines. It usually works really well, and on the inside I'm like "Oooh! How delightful! Delicious raspberries with my balsamic!" But I just mutter gruffly, "Yeah I'll have the balsamic." The waitress repeats back, "You'd like the raspberry truffle balsamic dressing with your apple pecan salad, sir?" "Yep," I grunt coolly. 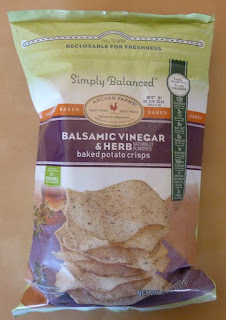 Thankfully, these chips offer simple herbs with their balsamic vinegar. A great combo. And of course they're salty, so there's an easy comparison between these and traditional salt and vinegar chips. But for me, the salt and vinegar chip hater, these Simply Balanced chips are head and shoulders above other salt and vinegar chips. I can't put my finger on why. They do taste like balsamic, not just regular vinegar. And there are a few other herbs to help round out the taste—particularly garlic, which I also love. Have some breath mints on stand-by. Texture-wise, they're similar to all other baked potato crisps I've had. I really like those things. I'm not sure how fried potato chips are still so popular. I think the crisps are just as tasty, and of course there's less fat. Curiously, my wife who loves regular salt and vinegar chips, was not as enthusiastic about these as I was. And she likes balsamic vinegar, too. She thought they were good, but wouldn't go out of her way to purchase them again. I disagree. I think they're the bomb. I considered giving these 9 stars, but I think I'll settle on a still-impressive 8.